The Nodes of Excellence in (SEA) Universities through Spatial Data NEXUS project is an Erasmus + CBHE (Capacity Building in High Education) proposal whose main aim is to enhance the research capacities of HEIs in the southeast Asian region, by strengthening relationships between Education, Research and Innovation in GIS, SDI and remote sensing, for applications that are related to environment, agriculture and situations of emergency. The project will develop a common nexus between various actors of research and innovation (HEIs, research centers, spin-off companies) in Thailand, Myanmar and Cambodia where specific methodologies for innovation transfer are convergent with EU developments in accordance with Europe 2020 strategy and Smart specialisation initiatives which is a new engine to boost R&D growth and subsequently job opportunities and business creation. This will improve the transfer of innovation from universities to local and regional enterprises, enhancing their innovation potential for geodata use and generating new applied research. 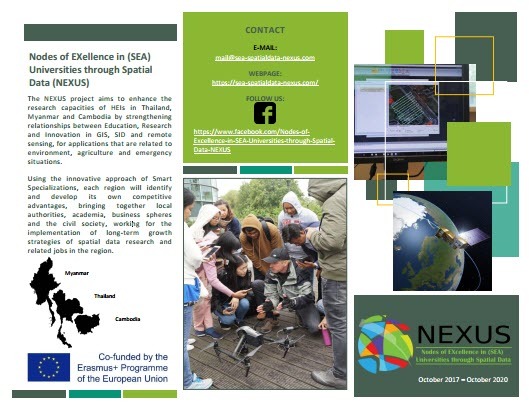 The broad goal of NEXUS is to combine industrial, educational and innovation resources in targeted countries and regions of South East Asia (Thailand, Myanmar and Cambodia) to create opportunities for knowledge-based investments while increasing research capacity of HEIs through GIS and remote sensing technology.